As sweet as cinnamon: Holidays over, the year begins! and my parents and grand children...they are such a delight! 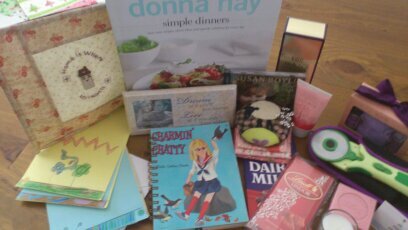 I felt truly spoilt...I love you all and your all so precious to me..
My Girls asked Why? is it called Boxing day? Christmas and give to the poor..
we would Box up some special things for the poor. but that didn't happen these Christmas/New Year holidays...soon I hope. and also had bought a 2012 refill diary for last years too. Now what does a girls do with 3 Diary's and new Phone book??? sweet Joy with the gorgeous fabic is for my sewing goals and to do's. everyday I write in something from that day which I appreciate. friends and laughter, and stories of old"
and it was devine..... we loved every minute of it. Great memories being built for my girls. to draw a picture or two for me to treasure..
and appreciate in the years to come! and reaching 300 posts we'll have a giveaway! What are your plans for your Diary? or Diaries? Here's to New years plans and attaining then! Great ideas for your diaries Dawn! Glad to hear you had such a lovely Christmas too. Your girls are so sweet. I am hoping my diary will help me make better use of my time this year. I know we all have the same amount of time, but I do have more than others and yet I don't make the most of that advantage. (I don't work or have little children, that makes me time-rich!) So this year I am hoping to make the most of the abundant time I have! Love the plans you have for using your diaries. I was given a Scripture diary by a friend, so as well as writing in all my notes and appointments, I will have verses to read and think about each week. Sounds like a wonderful holiday time you had with your family. Hoping this new year is wonderful for you. Happy New Year to you! Glad your holiday was so wonderful. Diaries. I'm a sucker for diaries and journals! I have one for my herbal concoctions, one for my visits with nature, and one for my daily thoughts and things I want to remember. Included in that one are my gratitude pages. Love the photo of the girls with the reindeer horns on. You have great plans for your diaries.Gorgeous idea to get the girls to draw pictures. Delighted you had a wonderful time with your family ver the holidays. I love your diaries ideas. I think I need to go out and get me some. I think I need to have one next to me at all times for the great ideas that I come up with.. that later I cannot remember. If only I would write them down when I think of them LOL. I'd love to make a hand written recipe book for my daughters as well with all of our family recipes and leave space to write in some new ones. I could slip in those papers from magazines I would love to try and see if they "make the book". So many ideas are coming to my mind!! your diaries are beautiful! I can't say I keep my 'notes to self' in anything beautiful! I have notebooks all over with goals, and things to do. I also keep folders that are seperate things I am working on! I keep notes on the inside of them and write all over them! To anyone else they would be like reading another language because I think I am the only one who knows what I am trying to say! Have a blessed 2012!! Congratulations on 300 posts by the way! Congratulations on 300 posts.....I love the idea of having your girls draw for your journal. I am going to have my grandchildren draw for me.....would be fun to use their art as designs to stitch and make into pillows for their parents next Christmas. I keep two journals....1 is for daily appointments, weather, prayer requests. 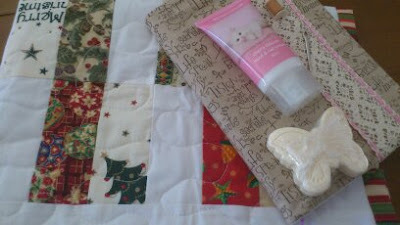 The other is for my quilting, stitching and sewing ideas....made and dreaming about making. Grand children's measurements and such. When my husband and I were married....40 years ago, I was given a blank book that I started writing recipes in....so glad that I wrote family favorites down before my mother and aunties passed away. Many of their recipes were in their heads and would be gone. Hope you have an amazing 2012. I was also given another diary by my MIL for Christmas so I'll be using this one to write my daily thoughts or happenings throughout the year :) Barb. Happy New Year! The diaries are lovely. I use mine for keeping track of appointments and other important engagements. My new diary & calendar are ready to go...the schedule is already looking a bit scary...just need to breathe! a daily diary helps me to remember what i've started, worked on, plan-to-do's ... helps me to move forward, prods me and jollies me along. at my age, someone has to do it! Happy New Year. In my dairy/journal I write all the going ons of my children. I have their work, uni and school times as well as my own tasks that need to be done and then notes on what has happened, so it ends up an interesting read to look back on the year. So glad you had a lovely Christmas and its lovely to have you back. Since my car floated away in the Christmas storms here in Melbourne I haven't been able to get to the shops so I don't have a diary yet. I awlays used to keep a journal years ago - but stopped - got so busy!. but just the other day I can upon a new/old journal book that I thought I must start writing in again. I am afraid I only keep a diary at work. It helps us keep track of the odd things that go on there, as well as appointments. Home diaries just do not happen. Congratulations on 300 posts! That's a great idea for your three diaries. I don't usually use a diary (I put everything on the calendar) but my MIL gave me A Quilter's Diary so I'm trying to get into the habit of putting things in it! Yay on reaching 300. I would use one for keeping track of everything. I have been keeping a diary of all embroidery projects I have done/or want to do. I also sketch up little pictures to embroider. Yeah, Dawn. 300 posts. Well done. Good work with the diaries, that is organisation. I would attempt to keep my life organised in my diary if I could find it. I have a sneaking suspicion I left it on the table in a foodcourt somewhere in Brissie while on holidays. Oh, well, back to the drawing board. LOL, I know what you mean about a holiday from the holidays....I'm still worn out! Looks like yours was very fun. Love all your gifties! Those diaries are really special, and what good use you're putting them to. Don't enter me in the give-away sweetie...but congrats on 300 posts, and I pray you reach all your goals this year! great ideas for your diaries. I'm just trying to keep my basic sewing journal up to date... a chore for me. I received a " Day Planner" from an overseas friend, it is Angel themed and has lovely stories regarding people who believe Angels have helped them in some way- very inspiring. I am trying to keep my thoughts and reminders of what I need to make or do or go, in it this year. Your giveaway is very generous of you. So, that's what boxing day is... I never knew. I have been keeping a diary most of the time all my life... and I just had my 78th birthday. I write my thoughts about my life, what I'll do with the rest of it and memories of days gone by. It's fun to pick up an old diary and see what I was doing back in the 'olden' days. What a wonderful holiday you all had! Love all of the pretty things you got - and the idea for an appreication journal! I hope you are getting all rested up - and that your New Year is full of blessings :)! Hugs! For the first time in the longest time I don't have a diary for this year. I keep my appointments and important dates to remember in my phone (Lord help me if anything ever happens to it). I really like your idea of having an appreciation diary. This year I am trying something I read on another blog. Rather than Carpe diem it suggested Carpe Kiaros. Have a read if you have a moment. It is wonderful. http://momastery.com/blog/2012/01/04/2011-lesson-2-dont-carpe-diem/ For me at the moment it tends to be a cuddle or kiss from my 17month old daughter that I didn't even ask for or her cheeky grin when she shows me she has learnt something new. A beautiful sun set I manage to see. All the "God Moments" For which I am grateful. My diary would be used to remind the whole family of the times we will have dinner together. We all get too busy doing stuff and forget the important things in life.